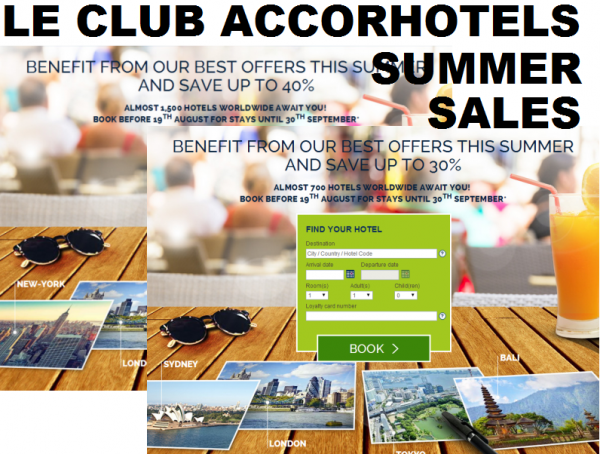 Accor has been sending out emails with up to 40% off Summer Sales for their European members and at up to 30% off their members in Asia. Both emails feature same destinations. The discount that varies is valid for stays up to September 30, 2014, but must be booked by August 19. You can access the European version here and the Asia one here. There are some exclusions for the participation and sale dates that vary from country to country. They are specified on the terms and conditions that you can access at the end of this article. The sale rate is 15% off of the best available rate but does include breakfast. The rate is same as the best available rate but has breakfast included. There is even lower breakfast inclusive rate for the dates in question available than the sale rate. Seems that this might be one of those sales that is no sale at all. You should, however, check the rates under this offer and book if they are competitive. This offer can be used several times during its period of validity, howevertit cannot be used in conjunction with other current promotions or offers. – The discount is based on the “Best Flexible Rate” (at time of booking). This Full deposit is not refundable even if The booking is cancelled or modified. This offer includes your room, buffet breakfast in the hotel restaurant, and a 2pm late checkout. Special Conditions: The customer’s credit card details are required to qualify for this promotion. Bookings cannot be modified or cancelled. The customer accepts debit of the full price of the stay upon booking; this amount is non-refundable in case of cancellation or changes to dates of stay. All reservations must be guaranteed with a credit card valid at the date of the start of your stay, unless specified. No cancellation charge applies prior to 18:00 (local time), up to 7 days prior to arrival. Beyond that time, the first night will be charged. – Minimum 2 night stay is required. – The availability of services mentioned may vary across all hotels. – Not valid with any other promotion or offer. Subject to availability at the time of booking. – Credit will vary as per the duration of your stay and hotel brand. The availability of the above mentioned services may vary across the hotels. – All taxes to be settled on check-out. The amount will be credited to your account on check-in and will not be paid in cash or against your applicable room rate. Offer valid for bookings from Jun 01st to Aug 15th and stays between Jun 20th and Aug 31th. – Sign in with your Le Club Accorhotels membership before you book andsave 20% from Best Unrestricted Rate with points!! – Sign in with your Advantage plus membership before you book and save 25% from Best Unrestricted Rate with points!! – Win additional prize when you check-in: breakfast, special gifts and more surprises are waiting for you! * Full deposit is non-refundable even if the booking is cancelled or modified. * Full amount of stay is payable in advance by a valid credit card at booking time. * This offer is subject to availability in participating hotels in South Korea. * This offer cannot be combined with any other offer/promotion. This offer is valid for reservations made at participating hotels in Australia between 05 May 2014 and 30 September 2014 (both dates inclusive) or earlier subject to availability. There is a limited allocation of rooms on limited days for sale at the “Stay 2 Save 20%” rate, black-out dates apply. A 2 night minimum length of stay applies to the “Stay 2 Save 20%” offer. Rooms in a participating hotel in excess of this allocation will not be available. Bookings must be prepaid online at www.accorhotels.com and this offer applies to stays between 01 June 2014 and 06 October 2014 at participating hotels (both dates inclusive) and are non refundable. Accor Advantage Plus members receive their 10% discount on the “Stay 2 Save 20%” rate. The 20% saving is calculated off the ‘Best Unrestricted Rate’ at participating Pullman, MGallery, Quay West, The Sebel, Grand Mercure, Novotel, Mercure, ibis and ibis Styles hotels. The 20% saving is calculated off ‘Our Rate’ at participating ibis hotels. The offer does not apply to other brands including ibis budget. Payment must be made online by credit card at the time of booking. Bookings cannot be changed, cancelled, exchanged or reimbursed and cannot be used in conjunction with other discounts or special offers. Prices displayed are per night for single or double rooms and exclude breakfast. Such prices are in local AUD currency (as stipulated at the time of booking) and are inclusive of all local taxes unless otherwise stipulated. Exchange rates are given for information purposes only and are non-binding. Currency applicable to the transaction and charged to your credit card is confirmed upon booking. 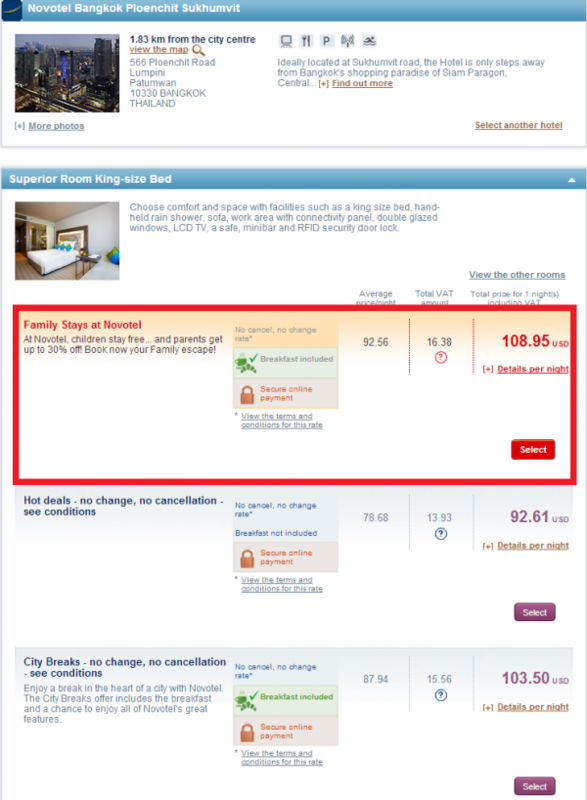 At the time of booking, if the “Stay 2 Save 20%” rate is not available for the dates requested, another public rate will be suggested automatically on the rate screen.